Has anyone ever had the kind of weather we had in San Francisco last week for as many days as we had it? It was a run of perfectly sun-drenched 60s days that are the ideal backdrop to hanging out in a city - and people, believe me when I tell you that we made the most of it. 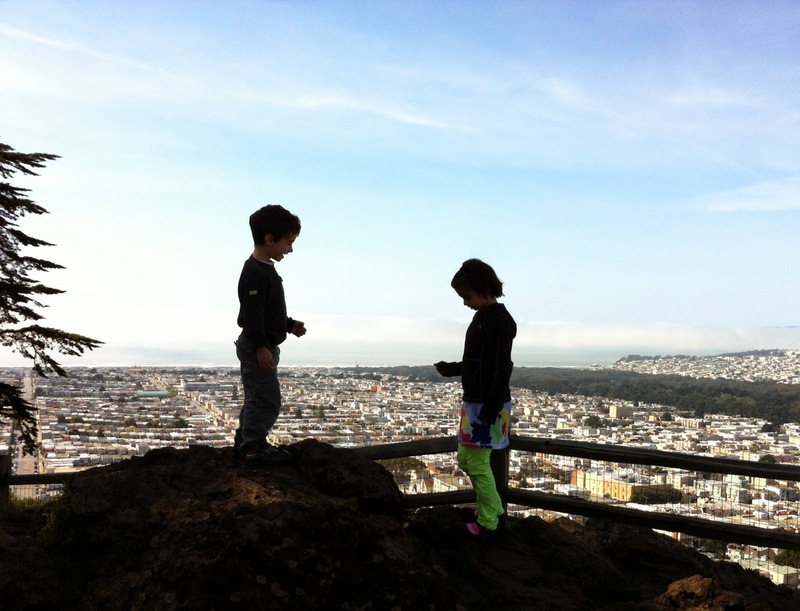 Of course we hit all the old jackpots: Muir Woods, the Exploratorium, the Academy of Sciences. But now that the kids are old enough to actually enjoy looking at things and not just craving playground after playground after playground, we found some new (to us!) places to be sad about leaving behind. It was also so completely great to spend as much time as we did with the family. Totally fantastic trip all around. Best new discovery? 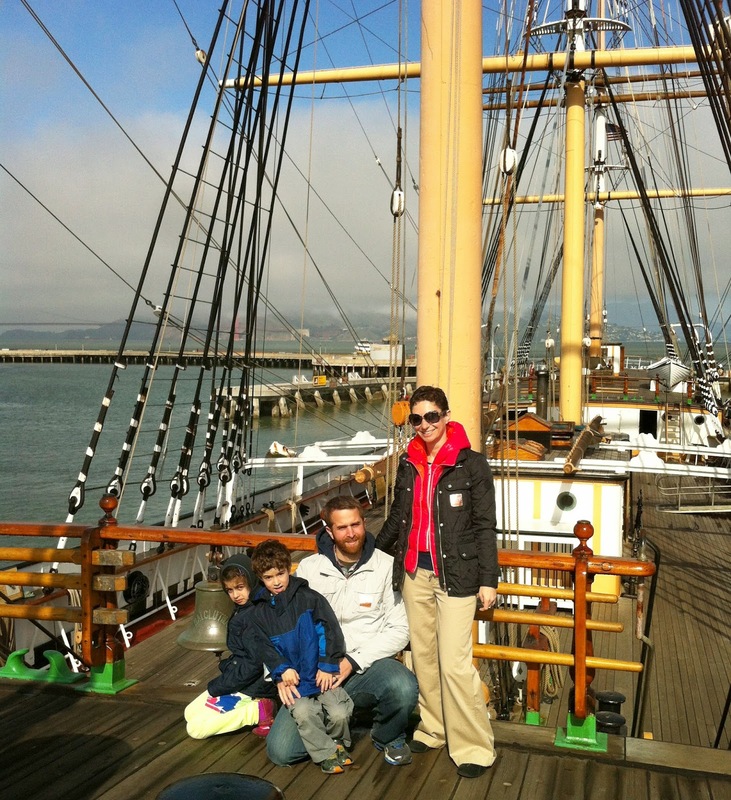 The nineteenth century sailing ships at Hyde Street Pier, near Fisherman's Wharf. 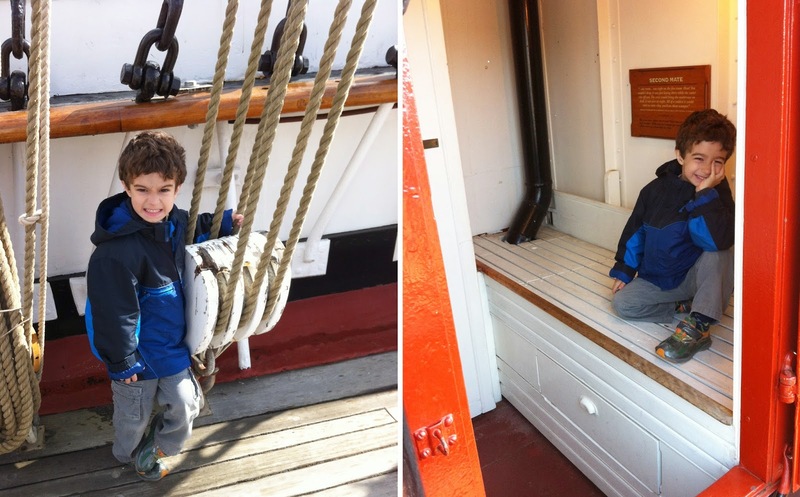 Here we are on the Balclutha, which has now become the kids' favorite name for any make believe character. 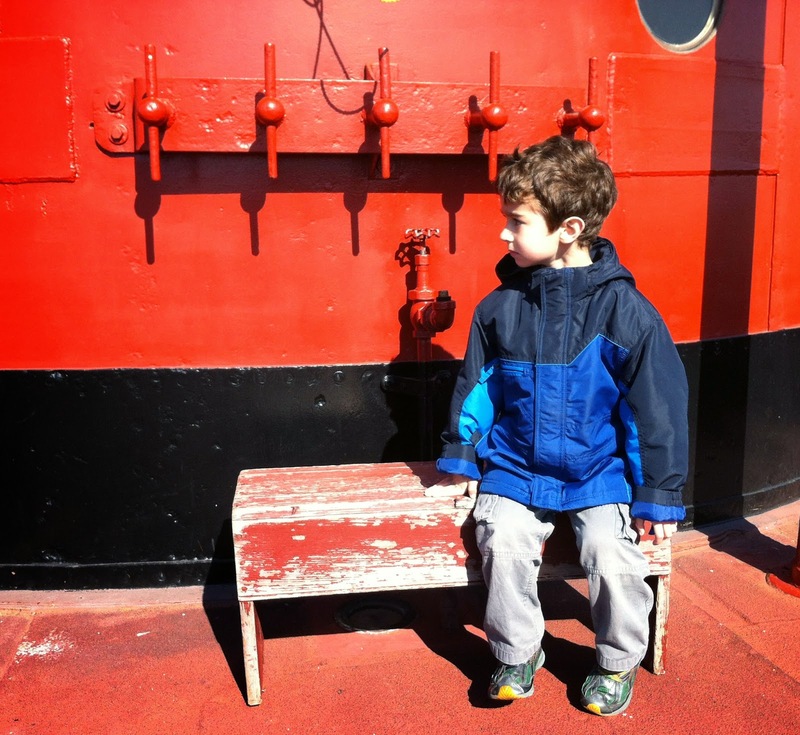 Misha took this arty blue and red shot of Captain Jake. And there was no beating the confluence of awesome as Jake went wild over all the pulleys, levers, wedges, screws that operated this huge sea-going machine. Why? Well, his class has been studying simple machines for the past few months, and here he was - suddenly in simple machine heaven. Check out that fierce face as he demanded to be photographed with "a three-grooved pulley!" 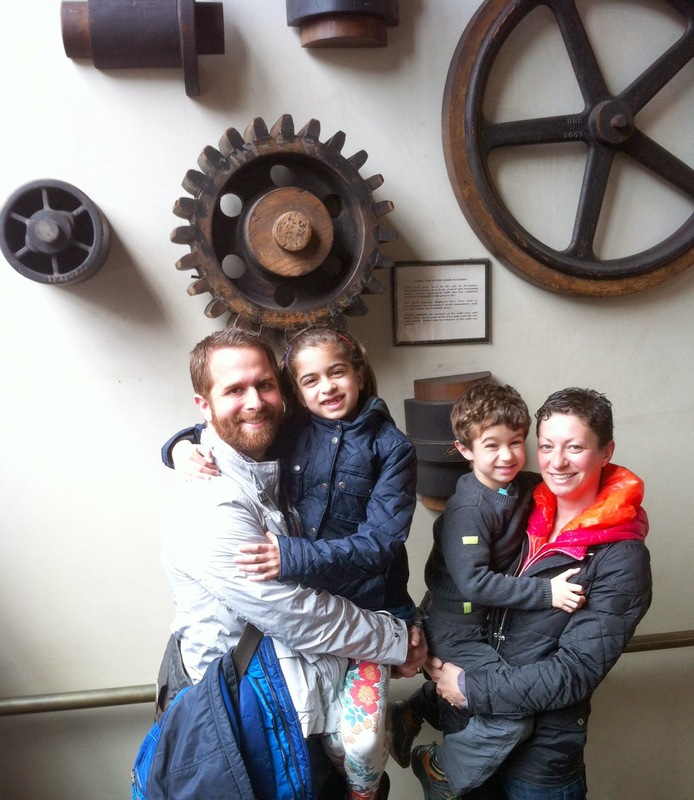 The simple machine extravaganza continued at the Cable Car Museum which is basically one giant love poem to gears of all shapes and sizes. Did you know that cable cars don't have engines and that they move by grabbing onto and letting go of a endlessly running underground steel cable? Well, now you do. 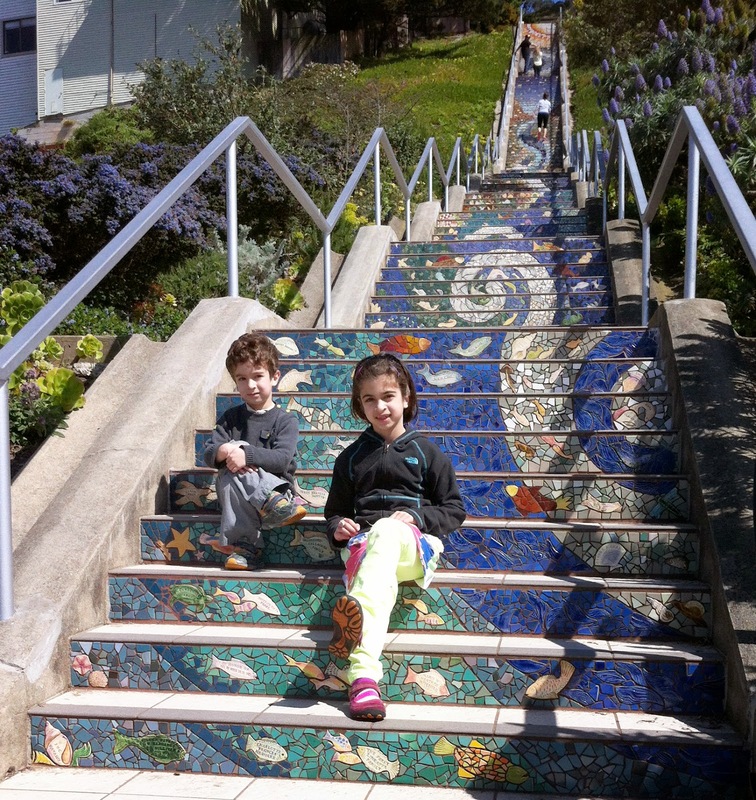 Next on the new landmark list was the the 16th Avenue Tiled Steps (on 16th and Moraga Street), a really long staircase with a continuous mosaic. As you ascend the stairs, the tiled images take you from the bottom of the sea all the way to the sun. And when you get to the top? You get to play sun god for a little while as you survey the whole city below you. 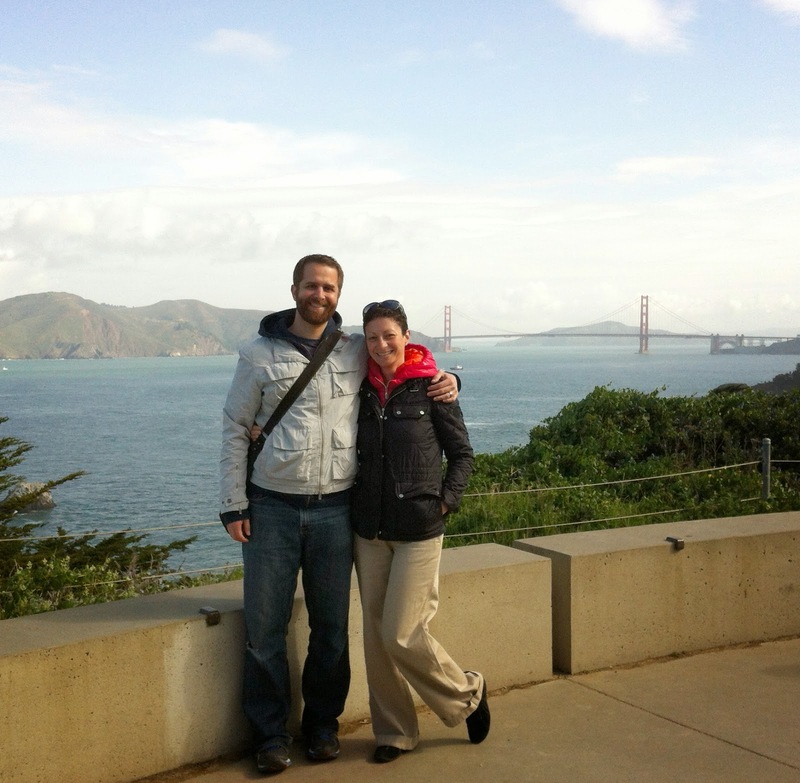 We also wandered around Land's End. No, not the beloved backpacking equipment supplier, but the park just north of Cliff House. The prize for hiking the whole trail? 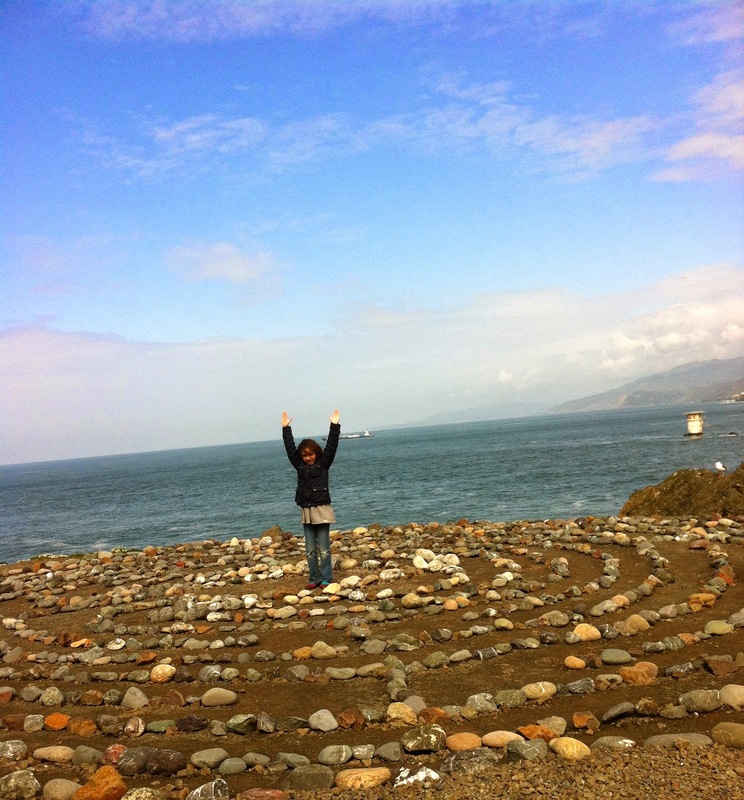 A huge stone labyrinth right on the water, which led to long discussion of why a labyrinth is different from a maze, and how that meathead Theseus would never have amounted to much if not for Ariadne's brilliant ball of yarn escape strategy. I mean, if you're not trying to connect as much of your daily life to Greek mythology as possible, are you really living? Lara the ever expert and fearless climber scaled pretty much all the climbable things that we encountered, as usual. 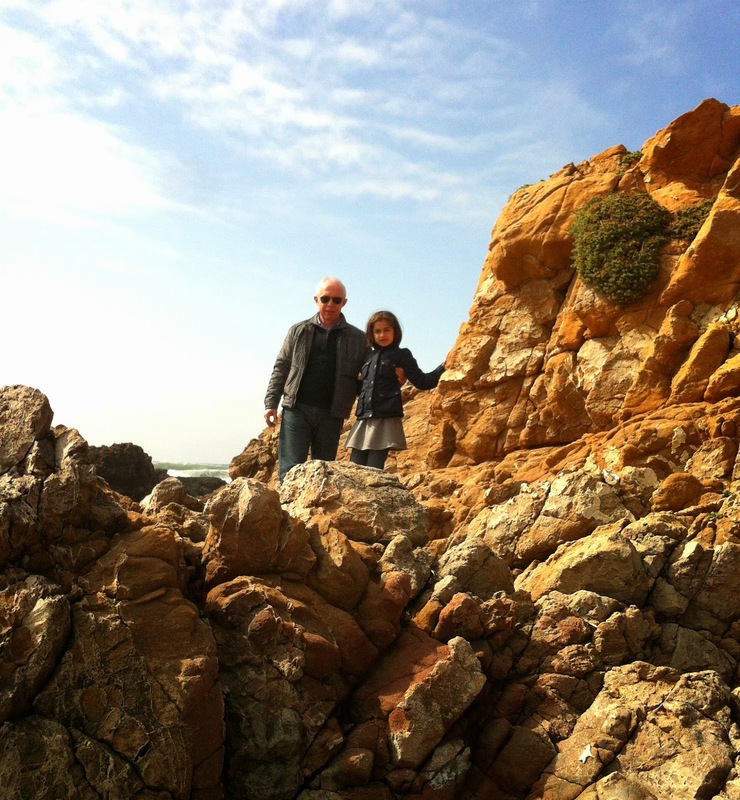 Here, for example, she and my dad are at the top of some rock formations at Pescadero Beach. 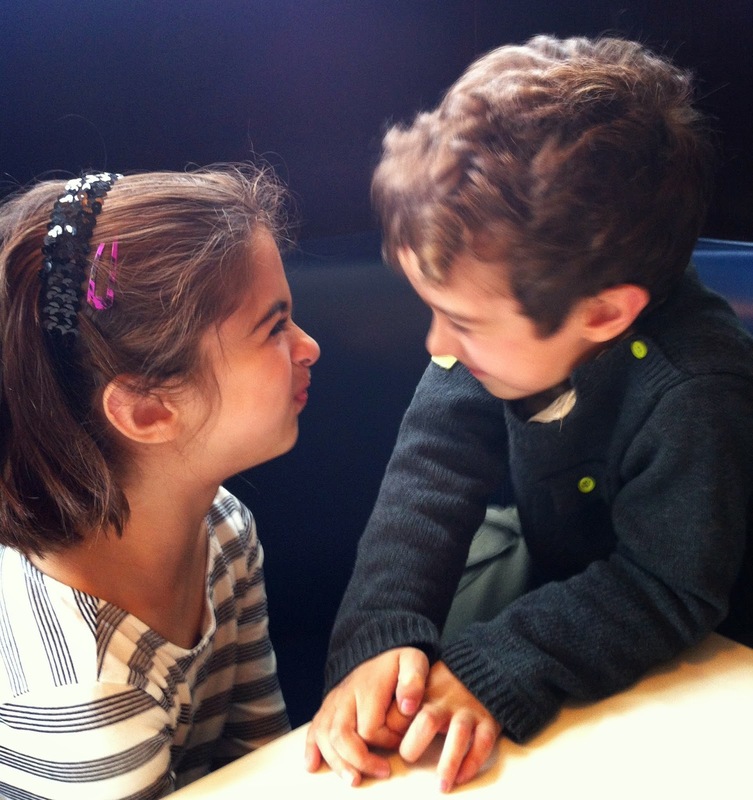 Here is some sibling love as they wait for some delicious concoctions from the Ghiradeli ice cream store. I had a banana split and would have happily continued to eat one (ahem, two) per day since. 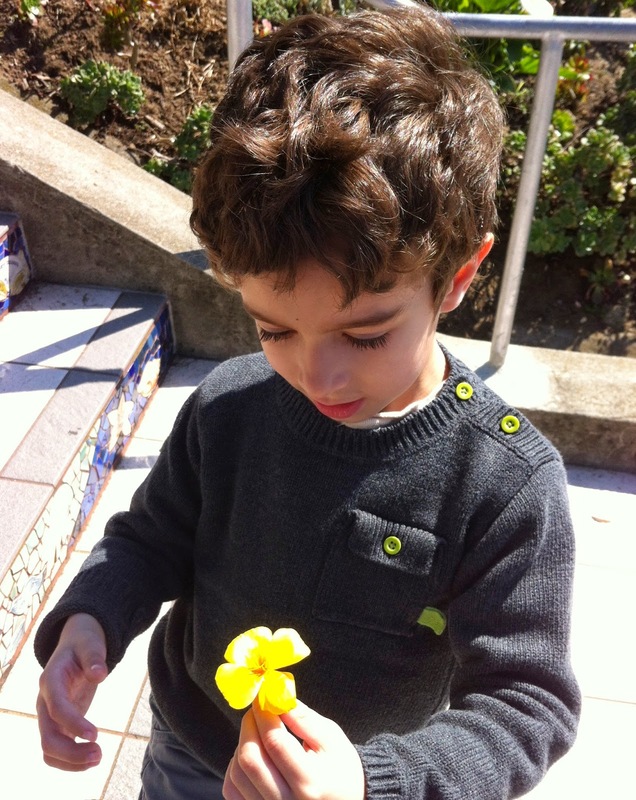 And finally, no trip would be complete without a catalog of things from nature that Misha found fascinating. (read: gross things). 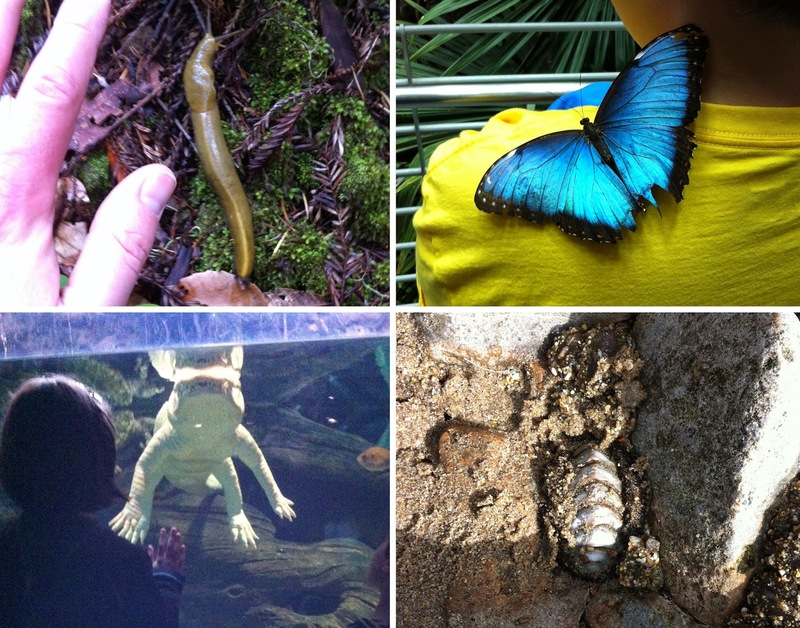 We have, in particular order: a giant slug from Muir Woods (that is Misha's hand for size comparison, people), an enormous butterfly (which, ok, yes, I get that butterflies are ostensibly pretty when they are in pictures, but these were enormous flying monsters in real life), an albino crocodile from the Academy of Sciences, and some kind of fossilized bug/shell/spinal column/who knows really from the beach.